The Desalination and Water Purification Research Program's funding opportunity aims to increase water supplies by reducing the cost, energy consumption, and environmental impacts of treating impaired and otherwise unusable waters. This funding opportunity will support two groups, including (1) laboratory scale projects and (2) pilot scale projects. 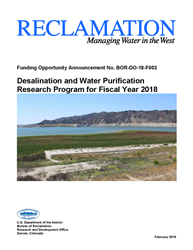 The Bureau of Reclamation has released a funding opportunity through its Desalination and Water Purification Research Program for fiscal year 2018. This funding opportunity invites private industry, universities, water utilities, and other research sponsors to submit proposals to cost share laboratory scale and pilot scale projects that address DWPR program goals and objectives. This funding opportunity will support two groups, including (1) laboratory scale projects and (2) pilot scale projects. Separate evaluation criteria and funding will be applied to each group. To view this funding opportunity, please visit http://www.grants.gov and search for funding opportunity number BOR-DO-18-F002. Applicants for desalination and water purification research projects funding must submit their proposals by 4:00 p.m. MDT on Tuesday May 1, 2018. DWPR's goals include increasing water supplies, reducing costs and energy consumption, and decreasing the environmental impacts associated with water treatment. This DWPR funding opportunity is seeking proposals to address these issues. Reclamation's DWPR Program works with researchers and partners to develop more innovative, cost-effective, and technologically efficient ways to desalinate or treat water. DWPR funding plays a critical role in iterating an idea from the lab to a real-world demonstration, which yields products that serve the water treatment community and attract commercialization interest. This funding opportunity for desalination and water purification research and technology innovation, the DWPR program is supporting the Department of the Interior's priorities, including: creating a conservation stewardship legacy second only to Teddy Roosevelt, utilizing our natural resources, and restoring trust with local communities, among others. To learn more about Reclamation's Desalination and Water Purification Research Program please visit http://www.usbr.gov/research/dwpr.